Welcome back to the Fest, Lyon Distilling Company! Lyon Distilling Company is a micro, craft distillery in Saint Michaels on Maryland’s Eastern Shore. Lyon produces rum and whiskey in ultra-small batches. Their goal is to create distinctly American spirits – working to define the category of New American Rum, and perfecting Maryland Rye Whiskey and American Malt Whiskey, while experimenting with obscure grains and varied finishes. Lyon rums come in six varieties including white, dark, ovenproof, and French-oak finished. They also offer Coffee Rum, Curaçao Orange Liqueur, Black Rum, and Rock & Rum, a white rum blended with a candied-orange caramel, and finished with dark cherries. Basically, Lyon says, Rock & Rum is “an ideal rum old fashioned – a smashing cocktail in a bottle”. 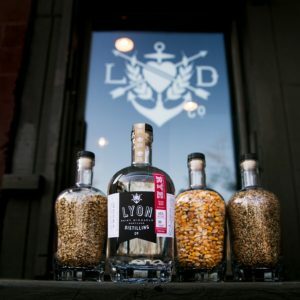 Lyon New Make Corn Whiskey, Maryland Free State Rye Whiskey, and American Malt Whiskey round out Lyon’s collection. Lyon will provide tastings and sales alongside more than a dozen other distillers of whiskey and other spirits. As well, the Whiskey Rebellion Fest will feature craft beer tastings, alongside the whiskey, rum, vodka and brandy samples. Guests at the Fest will also enjoy continuous servings of canapes by Good Carma catering, an open beer and wine bar, the opportunity to mingle with a nationally-renown George Washington ‘living biographer’ and other reenactors including George’s wife. Tickets also include the opportunity to play Colonial games, win one or more unique luxury items in the silent auction, photos with President Washington, and a goody bag to take home. Sober rides are available. Advance purchase tickets are only $50 – $75 at the door. Tickets are available at the Book Center, Centre St Cumberland, Main Street Books in Frostburg, through the Whiskey Rebellion Cumberland Facebook page or click here.